For me, all dishes made with methi are equal. But the Gajar Methi subji is more equal. 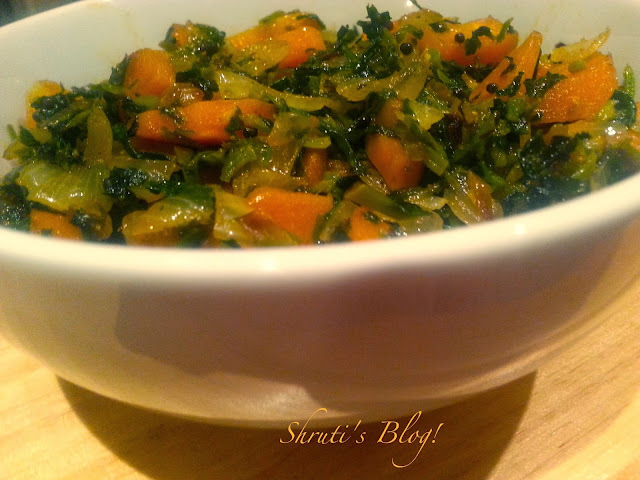 Very few vegetable combinations cause a “party in your mouth” to borrow a phrase from my younger daughter, like the gajar-methi subji - a match made in heaven. I believe it is owing to the symbiotic relationship the two share, and I don’t just mean the complementary nutritional values. The no-nonsense, rooted-in- common-sense constitution of Gajar lends constancy to the heady flirtatious aphrodisiac that Methi is! In its cooked savoury form, Gajar is often relegated to being a mere filler of colour, texture, or even nutrition - by crafty mothers who sneak some into 2-minute noodles as trade off. However, this subji is one dish in which Gajar holds its own ground as an equal, assuaging the fragrant but slightly bitter, piquant flavours of methi by its smooth sweetness. Gajar chivalrously lends body, moisture and a silky texture to the subji to set off the slight fibrousness of the leaves. Methi too comes more than halfway to this amalgamation with a lot of verve, lending aroma and savouriness, but accepting the tempering by the carrots with grace. The result is remarkable! I haven’t got good pictures of the dish - simply because I couldn't wait to dig into some hot jowar bhakri and this Gajar-Methi. Heat a pan and make a tadka (tempering) with the oil and mustard seeds. When the seeds begin to splutter, add the green chillies and onions. Sauté for a minute and add the hing and turmeric. 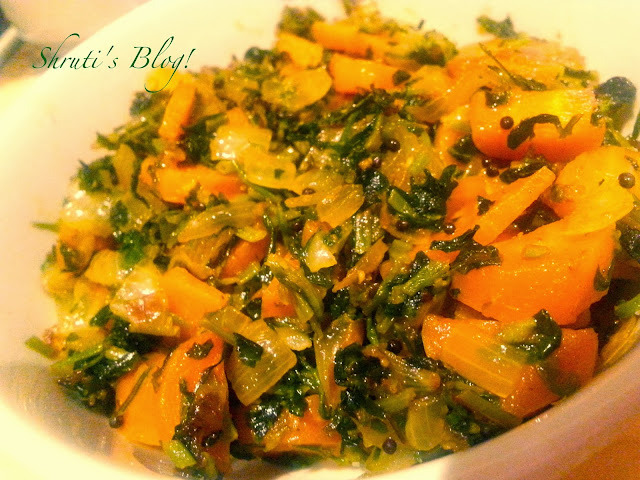 Add the sliced carrots and the chopped methi. Mix well and cover with a lid with a little water on top and cook for a few minutes. Remove the lid carefully so as not to spill the water into the pan. Add the coriander-cumin powder, salt and sugar/sweetener. Cook for a few minutes more, till done. Serve with bhakri or bajra roti/rotla, phulka or rice. The next time I make this, I would like to dress it up and serve it as party dish, with hot pooris! Good combination of two vegetables. i was a bit apprehensive when one of my friends presented a gajar korama rassa bhaji,but i had to admit it tasted fantastic! Yes, this does taste fantastic!